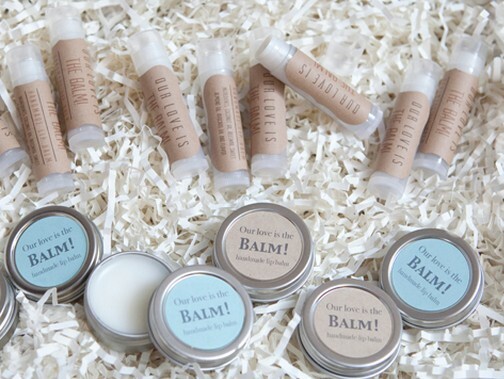 Make lip balms from scratch and use them as wedding favors! Follow the tutorial on the source to create this idea. See a tutorial for this idea using beeswax and rose petals. See a guide on how to safely use flowers for this idea. See a tutorial for using cocoa butter and pumpkin spice. See a tutorial for using butter and chocolate. See a tutorial for this idea using petroleum jelly and cinnamon. See a tutorial for using honey. See a tutorial for using berries and other fruits. See a tutorial for using beet juice to make a lip staining gloss. See a tutorial for this idea using edible glitter. See a tutorial for making swirling colors of gloss. See a tutorial for using different colors of gloss to make designs.